There is something about toast that nurtures the soul. Is it the aroma? It’s distinct. It doesn’t just smell of bread. No, there’s a twinge of something burning just enough to add some depth and flavor. Toast smells like mornings. Togetherness. A hearth-like warmth. It smells like home. It triggers a sense of comfort and security. Toast can signal the start of a breakfast feast, or a more modest sort of bite. The more earthy equivalent of the anticipatory aroma of a cake baking in the oven. Because really, the joy of toast comes from the the decadent torture of waiting for the bread to be cooked just so. And the variety in texture! Crisp on the outside of the bread, abrasive and rough, but then the soothing warmth of the inner crannies of the bread as you bite in. A bit salty, it dissolves in your mouth easy and fine. A neutral and perfect food with boundless potential. Like eating it with butter, for example, because there is nothing worse than the prospect of dry toast. Without a topping, toast is about as appealing as consuming sand (unless you’re hungover). Add butter, and watch it melt into a perfect, nearly-clear liquid as it seeps into the crevices of the bread. The toast’s jagged surface is then transformed into a moist sort of sponge, ready to be devoured by your eager and willing tongue. And by all means, be liberal with your toppings! If you’re going to indulge, you must indulge enough that the butter pools and slides off the edge of your tilted bread as you chew with delight. And if you have access to one of those adorable contraptions that imprints a design in your bread, then you are a truly lucky duck. Toast is a bit of heaven, a daily delight. Buttered multigrain toast with a cup of coffee is my simple treat, but pamper your taste buds as you see fit. Bread Varieties. Ezekiel Bread is my top pick for an onbscenely healthy yet satisfying piece of toast. I’m also a sucker for any variety of cinnamon-raisin delight. 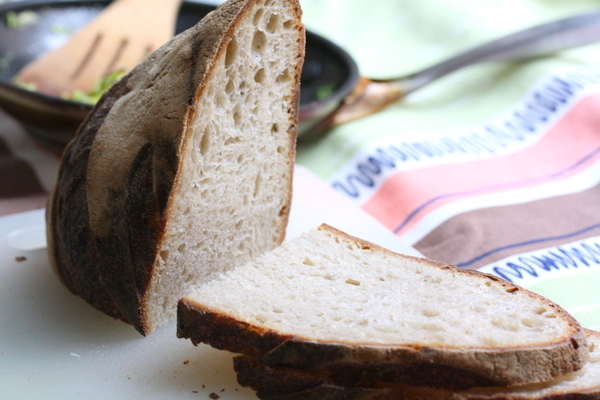 Rye or sourdough bread is a more savory option. But if you’re boring, or sick or something, white bread will suffice. Sliced bread is easier to use, of course, but unsliced loaves produce thicker slabs of toast with warm, soft insides. Toppings. Oh, the best part! Butter, or butter spread. Jam, jelly, marmalade, preserves. A thick layer of honey. Good ol’ PB&J. Butter, cinnamon, and sugar. Avocado! Perhaps a few slices of tomato, with a bit of salt and freshly ground pepper. Use some sort of binding spread, like peanut butter or cream cheese, and add sliced fruit. And you can’t ever go wrong with Biscoff Spread. Smear on some hummus or babaganoush. Mash up some berries and eat them on bread with a touch of cinnamon. And if all else fails, do something with Sriracha. Try making Egg-in-the-Hole if you’re into cheese and eggs and want something richer. This rich panini can be made on a skillet or in a toaster oven. Toss cherry tomatoes in a hot skillet until they burst with a bit of olive oil and garlic. Eat on toast, perhaps with fresh basil and cheese. Suzannah Schneider is studying Sustainability in Europe in Copenhagen, Denmark. This post was inspired by her favorite foodie book, Gourmet Rhapsody by Muriel Barbery. Just want to say your article is as surprising. The clearness in your publish is just nice and that i can assume you’re knowledgeable on this subject. Well along with your permission let me to clutch your RSS feed to stay updated with imminent post. Thanks 1,000,000 and please keep up the gratifying work.